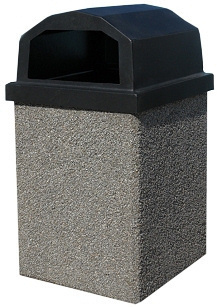 Lexington Series - Best Litter Receptacles Inc. 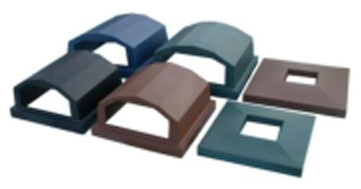 The Lexington Series can come in a variety of lid styles and colors to fit your needs. 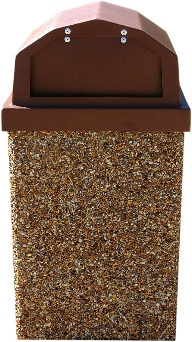 Match the aesthetics of the surrounding area with different aggregate shell styles to choose from. Multiple sizes for your specific needs. 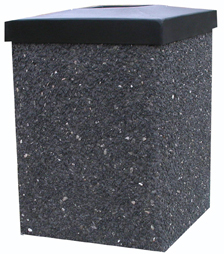 Receptacles are available in 30 and 40 gallon sizes. 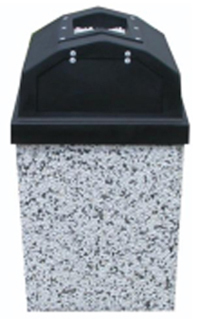 All receptacles supplied with heavy duty rotary molded lids and liners. Assortment of Lid Styles and Colors! Available in Low-Profile, Raised, Raised Lids with Ashtrays, and Raised Lids with Spring Loaded Doors in our Standard Colors of Brown, Black, Blue, and Hunter Green. 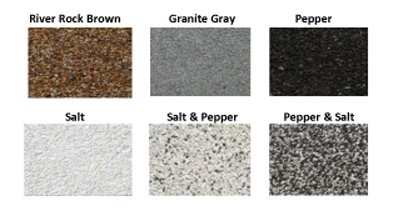 Exposed Aggregate Concrete Shells are available in River Rock Brown, Granite Gray, Salt, Pepper, and a combination of Salt & Pepper to blend into your specific area. The shell is reinforced and sealed to provide years of maintenance free service. Weather and theft resistant, the shell is manufactured to last.